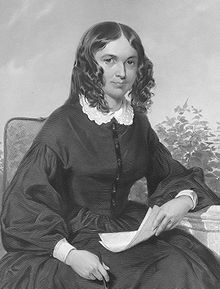 Elizabeth Barrett Browning (March 6 1806 – June 29 1861) was an English poet and the wife of fellow poet Robert Browning. To George Sand, A Desire (1844). shows a heart within blood-tinctured of a veined humanity. Lady Geraldine's Courtship, st. 41 (1844). The Cry of the Children, st. 1 (1844). To Flush, My Dog, st. 14 (1844). The Lady's Yes, st. 1 (1844). A Woman's Shortcomings, st. 5 (1850). A Musical Instrument, st. 1 (1860). Bianca Among the Nightingales, st. 12 (1862). Reported in Josiah Hotchkiss Gilbert, Dictionary of Burning Words of Brilliant Writers (1895), p. 247. Rhyme of the Duchess; reported in Josiah Hotchkiss Gilbert, Dictionary of Burning Words of Brilliant Writers (1895), p. 514. Reported in Josiah Hotchkiss Gilbert, Dictionary of Burning Words of Brilliant Writers (1895), p. 514. Toll Slowly; reported in Bartlett's Familiar Quotations, 10th ed. (1919). The justice to be honoured in his grave. Crowned and Buried, xxvii reported in Bartlett's Familiar Quotations, 10th ed. (1919). Hiram Powers's Greek Slave; reported in Bartlett's Familiar Quotations, 10th ed. (1919). "Pan is dead! great Pan is dead! The Dead Pan; reported in Bartlett's Familiar Quotations, 10th ed. (1919)..
Little Mattie, Stanza ii; reported in Bartlett's Familiar Quotations, 10th ed. (1919). The silver answer rang—"Not Death, but Love." From any use that pleased him! Good patriots, who for a theory risked a cause. While I . . it seemed no sun had shone on me. Smiling — so I. THY DAYS GO ON.